I meant to mark my one hundredth blog post in some way, but it passed me by, as does so much else…. This is the 106th post, and it’s just a few days under one year since I started blogging. I’m pleased that the average works out at two posts per week which is what I originally aimed for, although I’m aware that coverage has been a bit patchy at times. Never mind, I can always resolve to do better. Looking at Google Analytics today, I see that 1006 people have visited my blog over the year. Many of them have not come back, but the bounce rate is very low, so at least they mostly stick around for long enough to read a few pages. I seem to have more regular readers in the UK than anywhere else – of the top ten cities in the analytics list, six are in the UK, two in the USA and one in Australia. The tenth is described as ‘not set’ meaning, I suppose, all those computers that are not identifiable by location. Anyway, just saying…. I find this all moderately interesting…. Some months ago I wrote a blog about an unexpected gift I’d received – an Amazon voucher. I spent this on two items: a book about Amish quilting, and another about the Gee’s Bend quilters. I won’t review the first book – it’s interesting enough but a bit of a disappointment mostly because it was a very battered second-hand copy. I generally find when buying second-hand books through Amazon that the description of the book’s condition tends to be pretty accurate, but not in this case. The book in allegedly ‘good’ condition, was in bad shape. 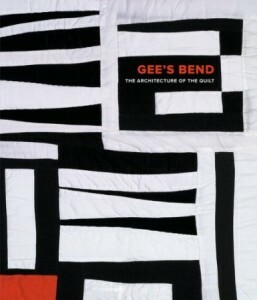 However, the other book ‘Gee’s Bend: the Architecture of the Quilt‘ was brand new, and very reasonably priced for such an impressive production. It’s an oversized book; a coffee-table book, I suppose, but this feature means that the photographs are relatively large and informative. It’s a stunning book and I’m very pleased to have it in my collection. The story of the Gee’s Bend community and the ‘discovery’ of the quilts by the art world are recorded in detail, and a very absorbing story it is too. The artists who created these wonderful artefacts lived in conditions of dire poverty, with very few resources to hand. Despite, or maybe because of, these constraints, they succeeded in producing this rich body of work. The artists have been compared, rightly as it seems to me, with Klee and Matisse, although these guys are, obviously, Europeans, and the Gee’s Bend work seem to be firmly rooted in the design traditions of Africa. There’s quite a lot of text in this book, which suits me as I like to read as well as to see. Some of the chapters have been contributed by a few of the younger quilters. Here’s a excerpt from Mary Lee Bendolph’s chapter: ‘The materials I use is mostly old material: pants, shirts, dresses, corduroy, jean pants. I take it and make quilts. Sometimes I use new material, but mostly I just use old cloth. People loved their pants or dresses, and they have worn out or just don’t fit anymore. I make quilts out of it because I hate throwing away things, because somebody can use things that people throw away. People are so wasteful now. It hurts me to see people waste up things. Because everything you throw away, it can be used and make something beautiful out of it. It makes me feel good when I take old clothes and make something beautiful. And old clothes have spirit in them. They also have love.’ Well, yes, Mary Lee, quite right. Although I think most of us would struggle to make something as beautiful as these women produced out of such worn and basic materials. It’s a lovely book, and it’s become one of the most treasured items in my little textiles library. If you’re looking for something to spend a gift voucher on, then this could be an excellent choice. A couple of days ago I had the opportunity to see and handle a lovely collection of textiles. We were invited to lunch with some friends and fell to talking about textiles. I knew they had collected some examples on their extensive travels in the Middle East and Africa, but hadn’t actually seen much of their collection. Below are photos of a couple of the pieces from their collection. I’m afraid the photos are, as in the last post, not top quality as they were taken on the iPhone in less than optimal light conditions. 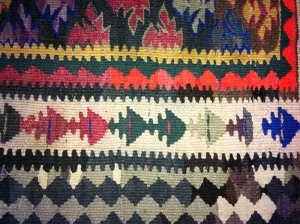 The first image is a detail of a Persian woven rug/hanging. The bright red is one of the most colourful sections of the rug which successfully combines a vast range of colour in the most skilful and striking way. The piece is around 2m in length and 1m across. It’s absolutely lovely, and the colour combinations are obviously the work of someone extremely skilled. 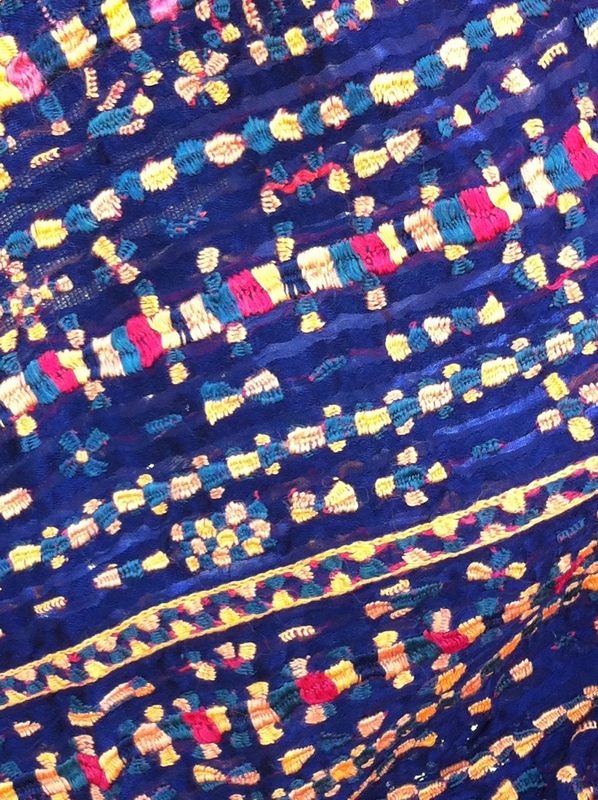 The second piece is a detail from a large embroidered hanging which our friends bought near the Egyptian/Libyan border. I think I’ve seen something like this before in John Gillow’s African Textiles book, but I’ll have to wait until I get home to read up about it. 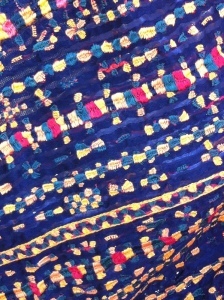 In the meantime, if any of you know more about this type of embroidery, please leave a comment. If I do track it down via John Gillow I’ll let you know. The collection included some other striking items from India and Africa. There was a beautiful example of mudcloth from Mali. I’ve bought a couple of these as presents for significant birthdays recently from the African Fabric Shop, and would dearly love to have one myself. Maybe one of these days…. These photos were taken with my iPhone which took it upon itself to decide that flash was needed. 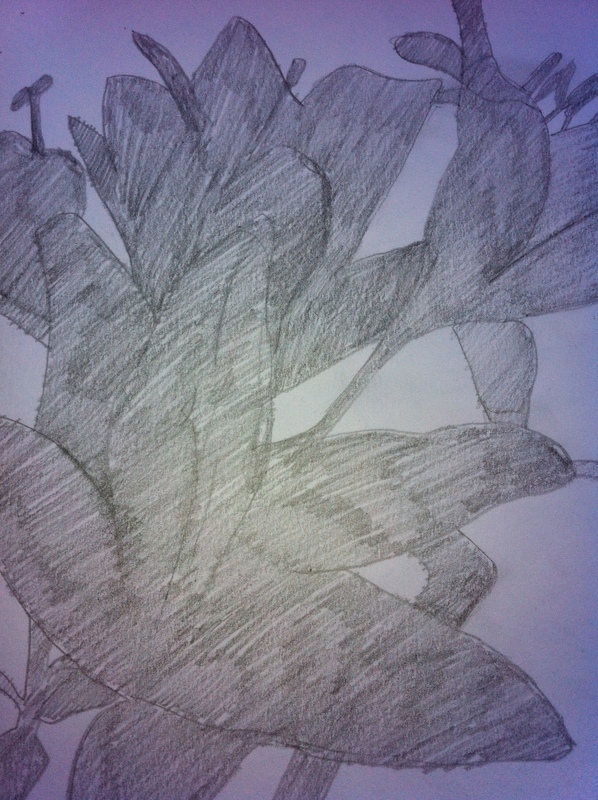 This seems to have bounced back off the paper, and the photo is not good. However, I don’t have my camera with me at the moment, so this will have to do. This is just a detail but you can get the general idea. I felt quite inspired by this, and would like to develop it further. 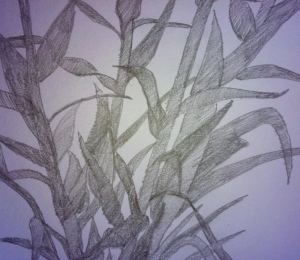 Still, I think that about lots of ideas and never quite manage it….. In this case, it would be interesting to do something with the negative space, possibly by adding some colour, or reversing the black/white. If I copy the image when I get home (I’m currently away on holiday) then I could try a few different approaches and maybe some different papers. But I suspect I know what will happen when I return: I’ll get completely absorbed in everything else that needs doing and will probably forget all about this. Still, I’ve got the drawings, and they’re a possible future source of inspiration. I said in yesterday’s post that I’d been doing a little bit of drawing. And it really is just a little bit. I would very much like to get into the habit of drawing every day but I’ve never been able to quite manage that. There are times when I do better but it’s never a daily habit. This means, inevitably, that I don’t draw as well as I’d like. But at least I draw sometimes. 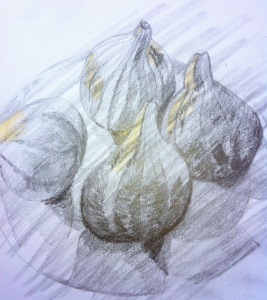 Here is a drawing of some figs I did the other day. What doesn’t come across in the drawing is that they had a most delicious figgy scent, so it was a pleasure to be around them. When I’d finished the drawing I ate one, and that was even better. When doing this, I was concentrating on getting the placement and proportions right. Even though nobody else is going to know whether the figs are drawn accurately, I know, and I try to get it right. This means that when I’m drawing something where accuracy really matters, like a face, then there’s an increased possibility of accuracy. Of course, accuracy isn’t everything, but I think it’s important in this type of observational drawing to attempt to get close. There were a couple of different light sources falling on the figs, which is why the shadows are complex. I really like that…. What’s insomnia got to do with anything? Well, it does have something to do with my unprecedentedly long silence on this blog. Apologies if it looks like I’m wandering off-piste, but it is relevant because chronic insomnia has had me in its grip for the last couple of weeks and I’ve found it very difficult to find the energy to do more than I absolutely have to. I’ve had insomnia for years on and off, dating back to when I had children when I lost the ability to just drop off to sleep without effort, but it’s been much worse recently. However, I think I may finally have found something useful. 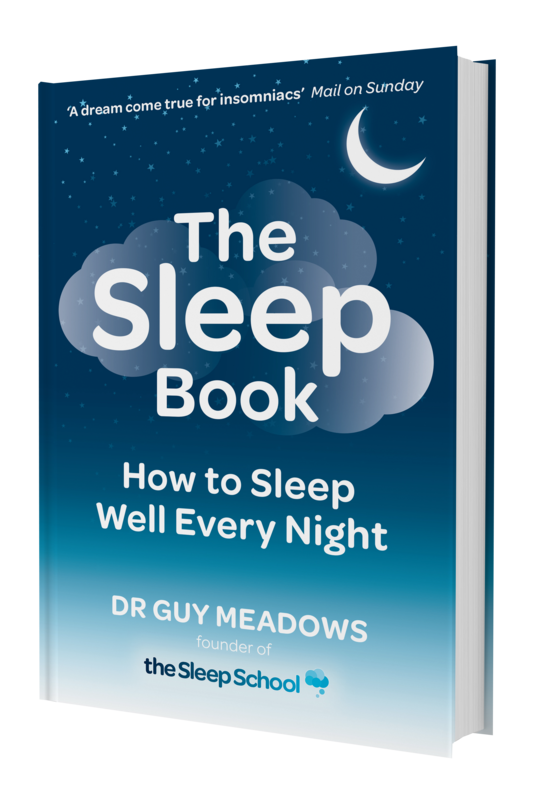 A friend recommended a book by a psychologist, Guy Meadows – ‘The Sleep Book’. 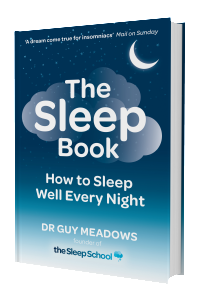 The approach described in this book rests upon the simple assumption that there is no point in fighting insomnia, as it’s a battle you are bound to lose. (And I can affirm this from my own experience of lying awake at nights unable to sleep). The therapy recommended in this book is, essentially, mindfulness. This is a very fashionable therapy about which I have, frankly, felt somewhat sceptical, perhaps because it is so fashionable. However, my inability to sleep had become such a critical problem that I was prepared to give anything a go. So I’ve done the exercises assiduously for the past two or three weeks, and I do believe it’s paying off. I’ve had a couple of better nights; although they have not been unbroken and I’ve lain awake for periods, I’ve not felt the usual sense of panic, the racing heartbeat etc, and I think I may be coming to terms with it. From the point of view of this blog and any creative work, I’ve simply been too tired and demoralised recently. However, if I get a bit more good sleep perhaps I’ll find my way out of the labyrinth and will be able to concentrate more on the things that make life worthwhile. I’ve been doing quite a lot of knitting as it doesn’t require much effort, and the systematic element of following a pattern is, to me at least, very soothing. And finally, to end, a bit of welcome art news. The National Portrait Gallery in London will be staging an exhibition in 2015 of John Singer Sargent’s portraits – from 12th February to 25th May. I love his paintings and I’m looking forward to the exhibition very much. Hope I can get to see it more than once; there are 70 portraits in it which will be too much for one viewing I think. More soon, I hope. I’ve been doing a bit of drawing in recent days and will share that with you. Before I go, I’ve noticed there have been a lot of visitors to the blog recently. Sorry there’s been nothing new for you to read. In my new capacity (I hope) as a well-rested and alert person, I intend to write more regularly.